The next meeting of the Society takes place on Thursday 8th November at 7:30 pm in St. Andrew’s Church, Bilston Street, Sedgley. The speaker is Vic Smallshire, Chairman of Dudley Canal Trust and dedicated campaigner for the Black Country canal network. Vic’s slide show is a record of the restoration and conservation of a vital piece of the waterway. Work began in 1964 and a rolling programme of improvements has made this venture into a remarkable tourist attraction. Take a look underground here. A new centre for visitors is at the design stage and ambitious plans are still to be realised for some disused tunnels. This meeting is a chance to hear about the reopening of access to the limestone mines and meet the man who has battled for 50 years to preserve Dudley’s canal heritage. 2012 Autumn Teaser - Answer "Well I never ..."
This photograph came from the collection of the late Wilfred Barratt and was sent in by his daughter, Marilyn Palmer. Wilf was a member of Dudley Camera Club with a passion for recording the part of the Manor where he lived. 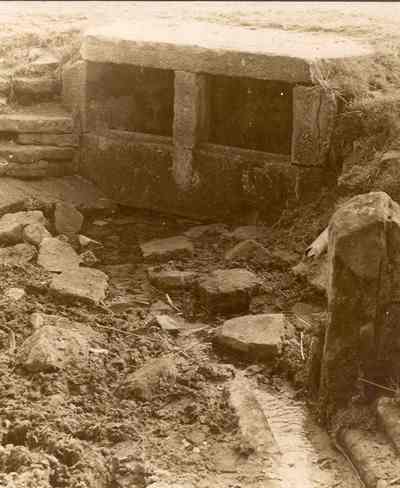 Rewarton Well of the 1600s morphed into the Sugar Well, so named because of the taste of the spring water. It is approached between two houses on the west side of Foxlands Drive, Ruiton, Upper Gornal. The water feeds three pools which once formed part of Ellowes Hall ornamental gardens before flowing into the Straits Brook, also called Bob’s Brook.